Definition at line 31 of file CQReportListItem.h. Definition at line 27 of file CQReportListItem.cpp. Definition at line 34 of file CQReportListItem.cpp. References FROM_UTF8, CCopasiObject::getCN(), CCopasiObject::getObjectDisplayName(), and mCN. Definition at line 50 of file CQReportListItem.cpp. Definition at line 52 of file CQReportListItem.cpp. Definition at line 54 of file CQReportListItem.cpp. 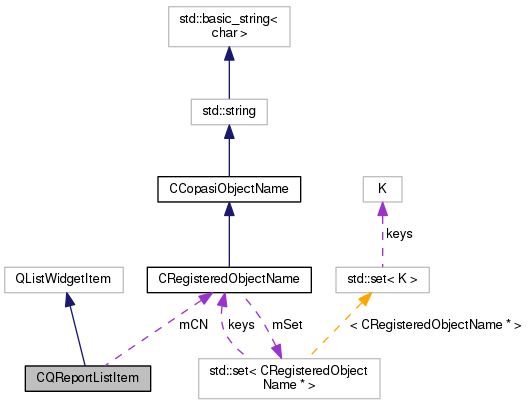 References FROM_UTF8, CCopasiRootContainer::getDatamodelList(), CCopasiDataModel::getDataObject(), CCopasiObject::getObjectDisplayName(), and mCN. Definition at line 47 of file CQReportListItem.h. Referenced by CQReportListItem(), getCN(), and refreshText().